Fitting a lighting automation system in residential properties is now regarded as "standard specification". Over the past few years, it has become far more cost effective and simplified - no longer confined just to the world of the "custom install specialist". Now accessible to a wider audience, we can provide home owners with a detailed system design and finial commissioning service, so their own electrician can undertake all the electrical wiring. This reduces the overall costs considerable. Lutron lighting controls offer a wide range of lighting solutions for residential properties - from 1 light circuit up to a whole house system, and everything in between. lutron lighting | uk online shop has simplified the purchasing process - you can either purchase everything online or call our support desk for help and advice, then purchase off-line over the phone, or continue with an online purchase. Also rest assured that every online order is first examined by one of our specialist engineers before it is processed to ensure you have the correct items, and if we are in any doubt we will contact you just to make sure. How to select the right lighting automation system for your home. Whole house systems, as it suggests, provides a system to control every light circuit in your home. 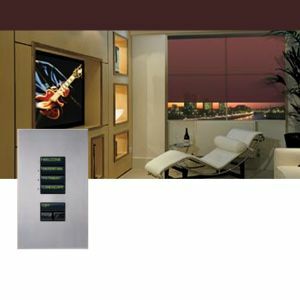 In simple terms it works by having a light switch wall station which is totally soft-configurable to switch or dim any 1 or any combination of lights. And the import feature is, that as every wall station is soft-configurable, they can be re-assigned at any time in the future. It consists of 11 buttons in total. There are 2 columns of four buttons, these are programmed for light scenes and shading controls. The low group of 3 buttons are normally configured as an All Off and dim up and dim down control. Light Circuit 1 centre ceiling lights, may be a chandelier, or some recessed down lighters. Light Circuit 2 periphery ceiling lights, likely to be recessed angled down lighters to wash light on the walls. This 4 circuit configuration is a typical lighting configuration for a principle living space as it will produce very dramatic mood lighting scenes. We would then typically group the 4 buttons on the right to control the lights within the room while the four buttons on the left would have special functions. The top button would switch all the lighting in the living room to Full On. (note Full On may actually be only 90% on, I will explain why at the end of this page ). Light scene 2 and scene 3 could be for watching TV or entertaining friends, while scene 4 is for viewing a late night film. This configuration would produce a very relaxing atmosphere. But the important point is that the pre-set light scenes can be changed and re-assigned to suite the room and how it is used. remember, nothing is fixed in stone, it is all soft-configurable. There are also some other clever features, for example, press the top button to close the blinds, then press it again to stop the blinds in mid-way, then either press the same button again to continue to close the blinds, or press the other button to re-open the blinds. These could be used to control lights in an adjacent living space. We could create a path of light from the living room, through the hall to the kitchen. Creating a path, maybe setting 2 or 3 light circuits in the hall to mid dimmed levels, and setting the lights on in the kitchen to a pleasant light scene. Pressing the button again, when you arrive back from the kitchen, turns the path off. Special button 4, could light a path to the front door, so when callers arrive you can set lights from the living room via the hall to the front door. The point here is to demonstrate, that each button is totally soft-configurable, it can be assigned and re-assigned to any combination of light circuits. Now apply this to your whole house. You can quickly see that you can create a whole house lights off button by the bedside, like wise a whole house lights on panic button. Create a path of light from the master bedroom to the kitchen via the landing and hall. You will also be able to have whole house light scenes, this is ideal to set all interior and exterior lights for an evening or night time setting. With internet access, you can control lights and even the heating system from any where in the world using a lap top or mobile-pc device. Room by room systems provide the same level of lighting control with-in a room, but provide less opportunity to control lights in other spaces. It is possible to create some whole house light functions using the system, but there some limitations. Firstly the whole house function will only control rooms where the lights are on the system. Also the combinations are restricted, but having said that, for a property with fewer rooms, like an apartment or say a 4 bedroom executive home, a room by room system is very cost effective and will cover 80% of the whole house system functionality. The reason is basically to extend lamp life. If we set the full on to be 90% and the dimmer to soft-start (soft-start means the lights dim up over a second or 2 rather than switch on instantly) this will extend the life of low voltage lamps almost indefinitely. I say almost as the lamps must fail at some point, but systems we installed for clients 8 years ago, are still using the same lamps. Now the cost of the lamp is not the issue, but the cost and time needed to continually replacing lamps is an issue when you have 100+ fittings. If you had a property with 100 low voltage light fittings on basic switches you would be replacing lamps every week. I would add that the indefinite life tip does not apply to mains voltage halogen or incandescent lamps, their life is only extended by 2 - 3 times normal life.